This is the Philippine's most common flower Hibiscus in which the painter drew his imaginative ideas from. 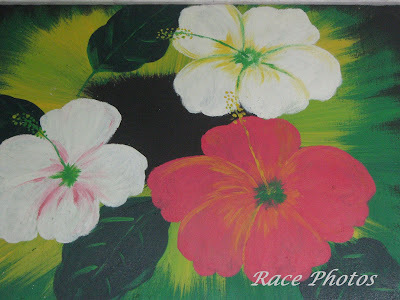 It's a simple painting but it caught my attention as the colors are so vivid especially the background splash of Yellow and the Red Hibiscus making it appropriate for my MYM and RT entries. Simplicity is beauty and so is this painting especially when you see it personally. Btw this painting shot was taken in the resort we rented last Aug. 12 when we took a day off our work and activities to celebrate pastor's birthday. There are 3 paintings in that resort and I'll showcase the other two in my future entries. Got stock of them huh!